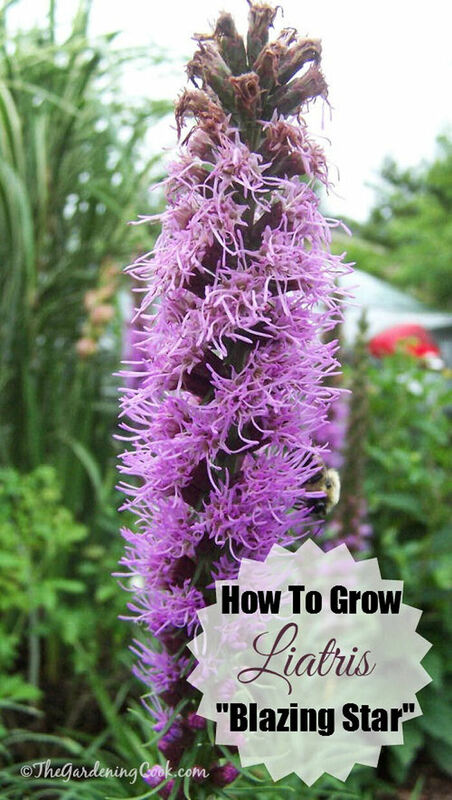 13 Tips for Growing Liatris - Attract Bees like a Magnet! 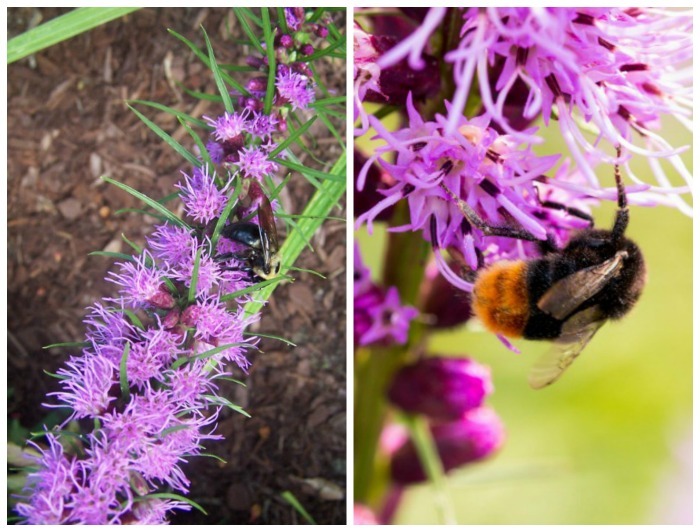 13 Tips for Growing Liatris – Attract Bees like a Magnet! If you want to attract both butterflies and bees to your garden this year, try growing liatris. This perennial corm flowers in mid summer with a blast of flowers that are a magnet for them. I have 10 garden beds around my home and I’m always interested in growing perennials of all types since they come back for me each year. When I first started growing perennial bulbs, I purchase some Liatris corms. I did not know much about them but I love spiky flowers and though they would look nice in my front cottage garden bed. LIatris is often called a bulb but is actually a corm. See my article to help understand the differences between bulbs, corms, rhizomes and tubers. I now have this plant growing in several of my garden beds and the plants gets bigger and bigger each year. The plant has not disappointed me. The first year, I planted it, I got a few flowers but each year since, they have multiplied and are just lovely. Some clumps have dozens of large flower stalks and the flowers are very long lasting. Liatris could not be easier to grow. I planted mine, amended the soil with compost and watered evenly the first year to get it established. On subsequent years, I pretty much neglected it, other than adding a bit more compost and dead heading the spent flower spikes. The bees just LOVE these flower spikes. Liatris is commonly known as a Blazing Star. One can easily see why from the flowers. It is also called a gayfeather. 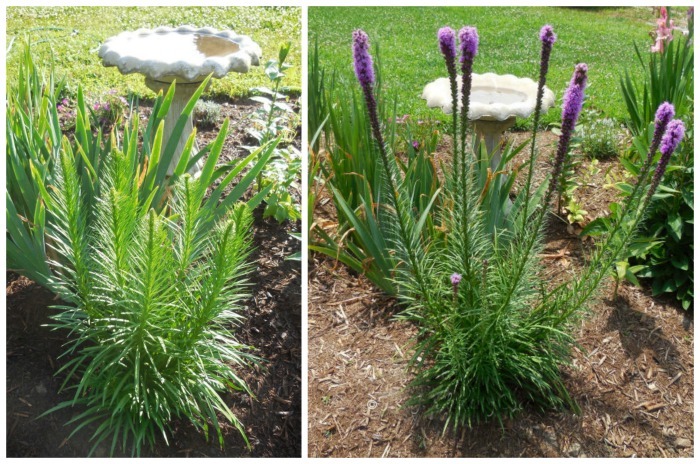 Liatris is a great plant for beginning gardeners. As long as you keep on top of the watering when the plant is getting established, it is then very easy to care for. This Perennial corm in hardy in zone 3-9 so it is able to grow in most areas of the USA. The corms are normally planted in the spring, but can also be planted in fall in some areas. They will often bloom the same year that they are planted.Flowers will bloom about 70-90 days after planting. The size depends on the variety and age of it, but my plant started out about 1 foot and now the clumps are about 4 feet wide. The flower stalks can grow up to 6 feet tall. Mine grew to about 30 inches the first year and my established plants now have stalks about 4 feet tall. 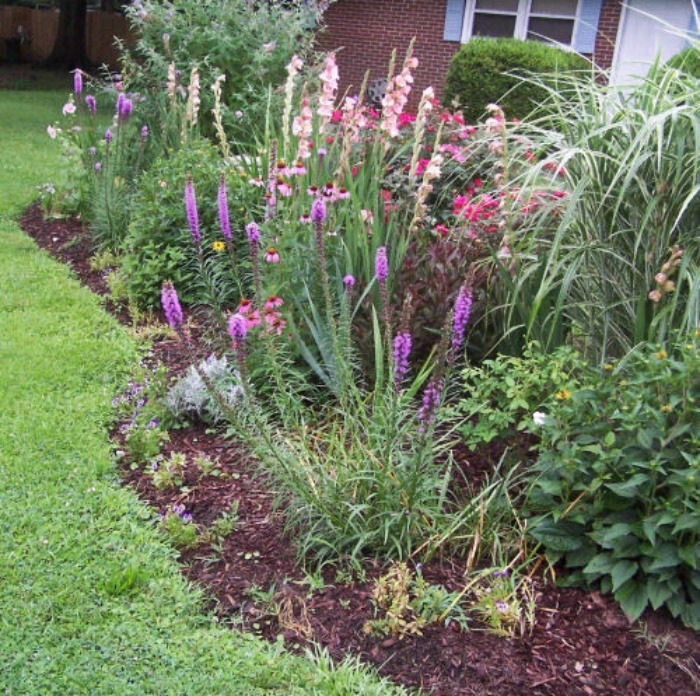 Be sure to keep the size of the plant in mind when planting liatris. Liatris loves full sun. Most of mine get 6-8 hours a day or even more. 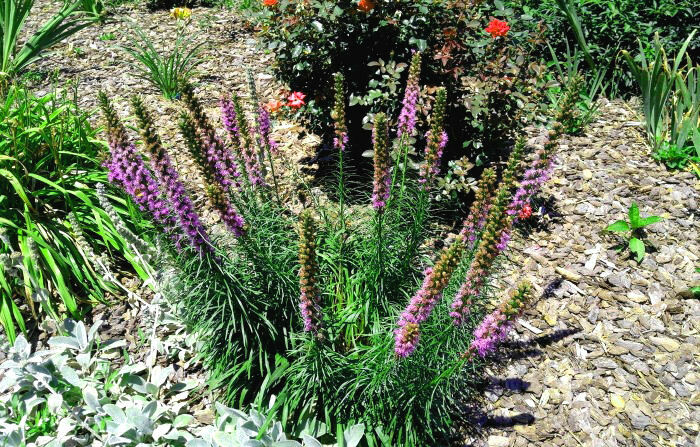 This perennial is a tough summer bloomer that does not mind the heat and even does well with a lack of water. It’s an easy to grow plant here in the heat and humidity of North Carolina. The flowers of blazing star liatris start blooming in mid summer and continue right through the fall for a long lasting show of colors. Even the spent flower spikes have an interesting. The liatris flower spikes have a mass of tiny buds that open gradually from the top down. It is very impressive and one can see where the common name “gay feather” comes from! The plant is most often seen with purple flowers but there are also white and pink varieties. Liatris are grown from corms – swollen dormant parts of the stem. They send up long shoots first which have a flower spike which just seems to keep growing and growing. Choose large corms and you will get better and bigger flowers. The plant will grown in pretty much any soil type, but mine have done well in well draining soil amended with organic matter. The don’t like soggy soil where the feet are wet. This can cause the corms to rot. A slightly acid soil is preferred. Adding used coffee grounds around the plant can add acidity to the soil. Thankfully, liatris are quite drought tolerant. Water evenly the year you plant them and then forget them! The only think they don’t seem to like is TOO much watering. Liatris don’t like wet feet. Split the corms of the plants in the fall. Dig them up after your first freeze and pick off any small corms that are clinging to the mother corm. Store the divided corms in a cool area and then replant the following spring. Space corms 4-6″ apart and the clumps 14-16″ apart -or even more. They will eventually get to be quite large clumps. Mine grew to this size the first year of planting! Great for cut flowers and long lasting color in the summer garden. They attract bees and butterflies like a magnet. The plant is deer resistant. 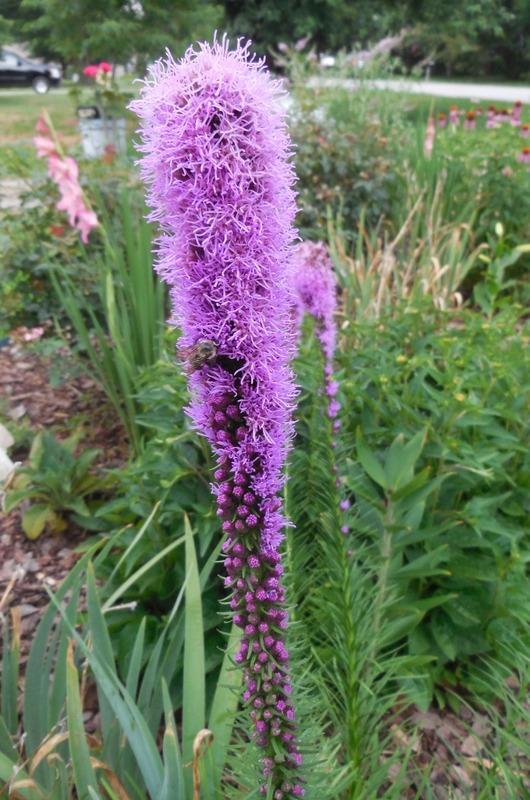 Liatris are relatively resistant to pests and disease. My main problem with them has been voles. The corms are a favored food of both meadow voles or prairie voles. I had liatris and other bulbs planted in my front garden bed for years and all of a sudden we had a problem with voles in the winter. This past spring, every corm was gone. No liatris, no tulips, no gladioli. The only bulbs that were left were my daffodils. Fortunately, they have not (yet) discovered my back garden beds. Follow the few tips above, and your liatris will give you years of pleasure. They can be grown with many planting companions, and liatris is always a standout—truly a blazing star in any mid-summer garden. To remind you of my growing tips, just pin this image to one of your gardening boards on Pinterest. 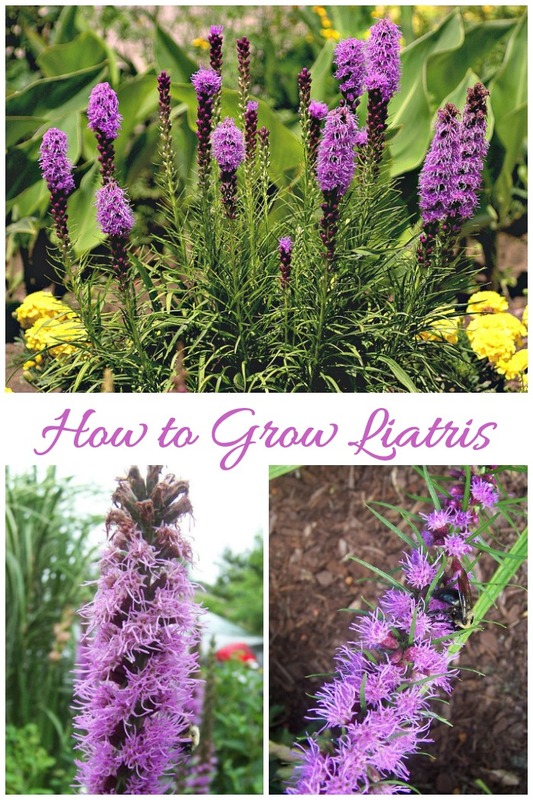 Have you grown liatris? What do you think of it? Admin note: This post first appeared on my blog in July of 2013. I have updated the post with additional information and new photos. Thank U personal experience is always gud . I bought a bag full of corms a few years ago and planted them all over my property. I was sad to discover that they need full sun. Some of the locations I wanted them are somewhat shady, so they either don’t grow at all or just barely poke up and never bloom. A couple of locations get more sun and have bloomed. Thanks for your growing instructions and all the nice photos. I had my first experience with this plant when someone gave me some & I wish I had dug them up & brought them with me when I moved. They were over 6 ft tall & had the thickest stalks…not to mention that they were growing in mostly shade! I ended up buying more since, & those have done very well in full sun & they reseed like crazy, but they don’t produce the same quality of plants like the first ones I had, but they still get everyone’s attention. It is actually illegal to take your plants from the garden after you have sold your house unless you state in your agreement that you will do it. The people who owned our house before us took a whole truck of plants with them. It made us very mad, especially that all they needed to do is ask. We ended with a 25×30 bald patch with nothing growing on it. I had the same thing happen in my yard. The whole back yard had all the azalea bushes removed. So basically you don’t have to dig up the Blazing Star in the fall unless you want to divide them? They are “winter sturdy”? How long after planting the corms, until I see something poke through the soil? It has been almost two weeks and nothing has popped through the soil yet…?? They have full sun and good soil! Great Plant for sure. I am experiencing some die back just as the flowers are about to form. I have not been able to find any pests that might be causing the dieback. Any suggestions? Terry, I had this happen too and I think mine were getting too much water. They all flopped over. I’m moving them and trying again next year. I have grown these the past couple of years and i love them. After they bloom and the stalk is nearly empty will they rebloom on the same stalk/ It is only mid July and they have already bloomed the entire length of the stalk. Will they bloom again or is it a once and done? Flower of Liatris is in small buds in spikes. And open from top to bottom. This is really very effective. I want to put it in my garden, its bulb will be found in India? Will it survive in the temperature here? The information you have provided is quite accurate. Blessed by. Hello Carol, I live in Johannesburg South Africa and have tried all over the country to buy liatris plants but without success. Do you think one could import these plants? Hi. I live in zone 9A in Florida. My liatris flowers turned black about 2 weeks I planted to them this past May. The leaves stayed green for a while but eventually died too. Now it’s September and I see a few green leaves poking up from the last dead stem. I don’t know what I did wrong. Thanks for the great post! How many corms do you usually plant together to make a good size clump like the ones you had pictured? Thanks in advance! This was a really helpful post! Hi Jessica. I can’t remember exactly. I think I might have planted 6 perhaps. They do naturalize and the clump grows larger each year. Very good article on liatris. Do you know if you can start liatris corm’s indoors under grow lights if temp is cool enough. I know they need a cooling period. I am trying to get a jump on 2019 gardening season soon. Most nurseries ship corms in the spring so if plants flower in 70-90 days that would put bloom time in June. I would like to see if i can get them to bloom earlier than that. Hi Joanie. It depends on the size of the pot. The first year, my plants came from one corm and grew to about 1 foot wide and about 2 1/2 feet tall with a taller spike of flower. Each corm makes one plant. In a pot, they won’t get as large. 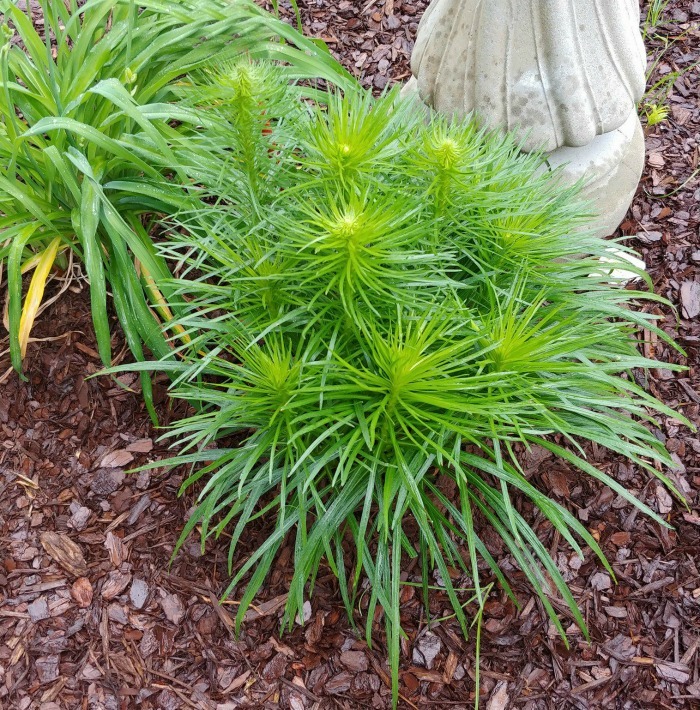 I am planting liatris along with some coneflower in a smallish bed. Do you think the liatris should go towards the back or it doesn’t matter? Are the two things kind of going to grow into each other anyway? Hi Lucy. I would plant it towards the back. The plant needs room to spread out in time. It’ll get about 3-4 feet wide and about the same in height. Hello! How many corms should I put in a 12” ceramic pot? I picked some up today and want to get them planted ASAP to try and get a bloom this year. I have ZERO knowledge about gardening but feel like I should do my late Mother proud by trying to grow a garden. She had spectacular gardens! I want to put them in pots because we will be moving by late summer and want to take them with me. 1 corm in the pot doesn’t seem like it will give me the ‘full to the brim’ look I want. Hope this makes sense. I would not put more than two to a pot. One might work best. Liatris needs room to spread out. They really are meant to be grown in the ground. The plant has an arching foliage habit (that gets very large but just one stalk. So getting a full look is not so easy in a pot. I have bulbs. Can I start these inside now, then transfer or keep in pots for summer? Most bulbs can be grown both in the ground and in pots. Generally if you start them inside it is to force blooms for indoors, not to replant outside later. Liatris grows well along side of daylilies, shasta daisies, Oriental and Asiatic lilies, hollyhocks, foxgloves and other plants that like full sun. I bought these for inside my pool fence to add some color. Are there usually tons of bees? I just worry because there will be lots of kids. Maybe planting near the pool isn’t a great idea? The bees do like the plants but it’s not like they are overrun with them. The bees are more interested in the flowers than people. Any flowers attract bees so having them near a pool means that they will be around.